More and more comes the communication with SAP back end system with standard protocols like HTTP in our focus. So it is easy possible to communicate with an SAP system without any additional libraries. 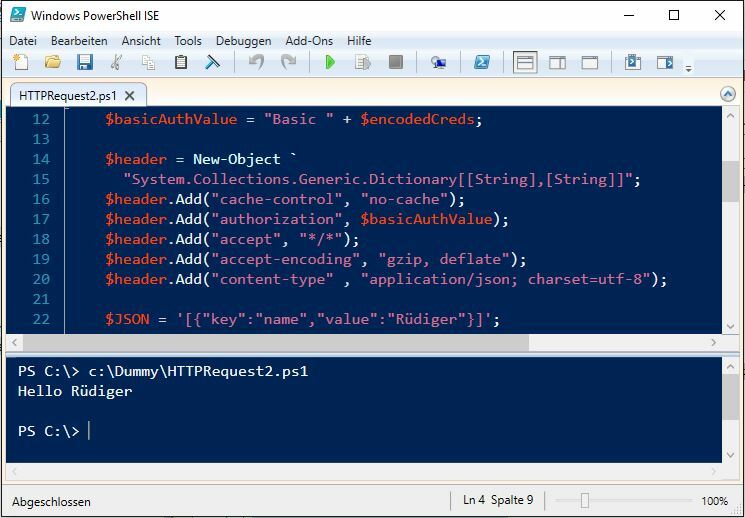 In this post I describe an easy example how to connect an SAP system via HTTP request from PowerShell. I start with an easy handle_request method in an ABAP class, called Z_STEFAN, which uses the interface IF_HTTP_EXTENSION. The method detects the request method and delivers always status code 200, which means ok, and a text. lv_verb = SERVER->REQUEST->GET_HEADER_FIELD( name = '~request_method' ). SERVER->RESPONSE->SET_STATUS( code = 200 reason = 'Ok' ). SERVER->RESPONSE->SET_CDATA( data = 'Hello Stefan' ). Now it is necessary to define a service with TAC SICF. I define a service, called stefan, at the highest level and I add my class Z_STEFAN at the handler list. Now it is possible to call this service from outside. Here a PowerShell program to do that. We start with the preparation of the user credentials and define a header for the HTTP request. The requested URI contains the service name, in this case stefan. 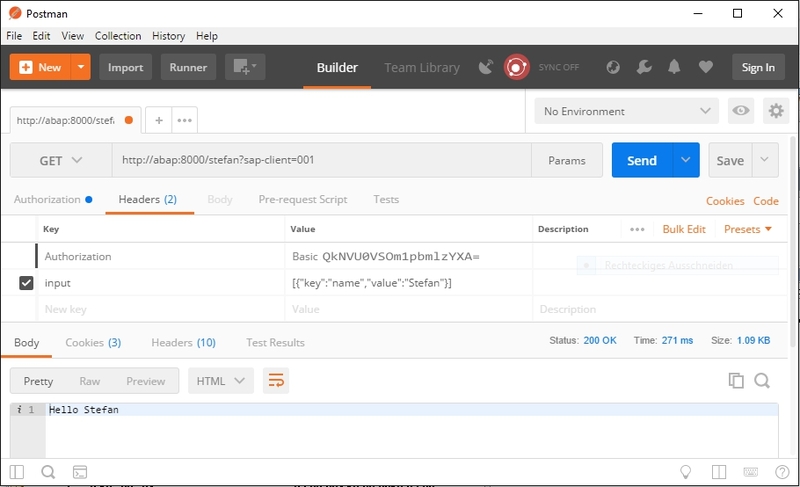 Then we invoke the web request with the URI, a GET request and the header. If all is okay, we should see the result in the console. In the next example I modify the class a little bit, so that it is possible to set and get data via an HTTP request. I add a header field called input which contains data in JSON format, in this case the name. With the method deserialize of the class /ui2/cl_json I dismantle the JSON string. lv_input = SERVER->REQUEST->GET_HEADER_FIELD( name = 'input' ). lv_output = `Hello ` && lv_name. SERVER->RESPONSE->SET_CDATA( data = lv_output ). 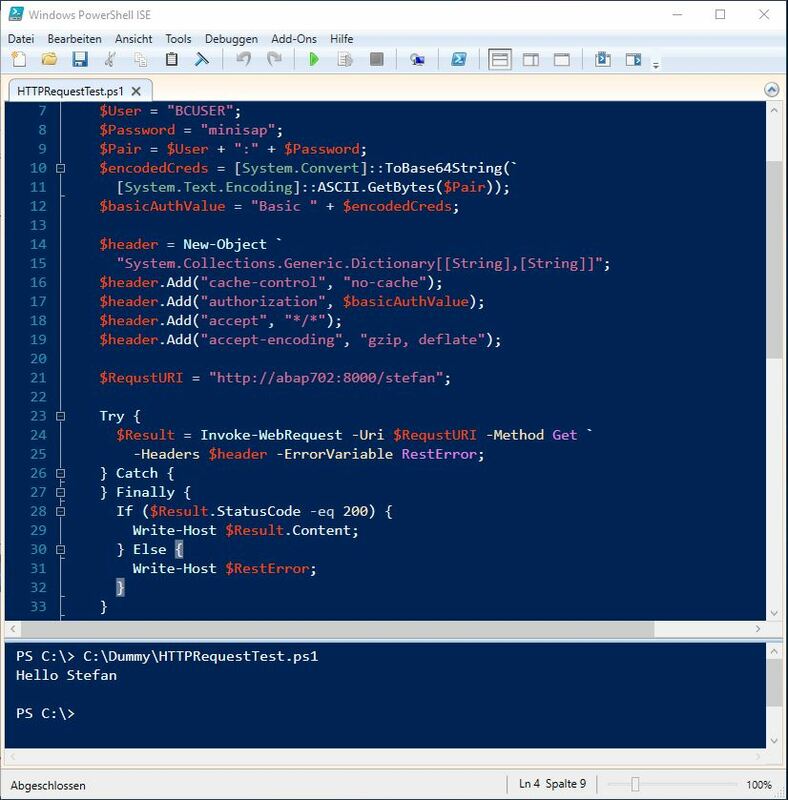 Here the PowerShell script to call this method. 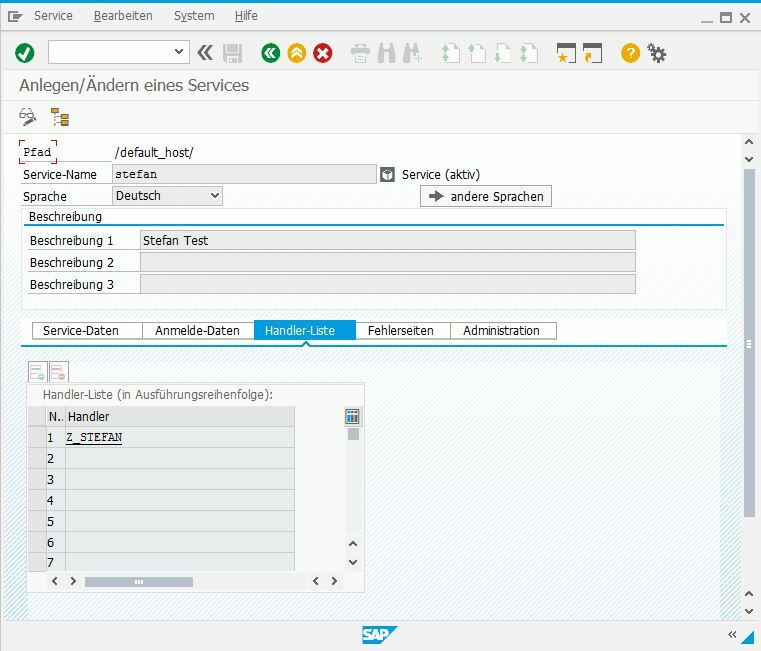 I add the new header field input with a JSON string, which is equal to the ts_record structure in the ABAP class. The result is exactly the same as in the example before but now you have the possibility to set each name you like. In the next step we will change the design of the class for a better unit testing and using of the functionality in a possible different context. This has no effect on the functionality. rv_output = `Hello ` && lv_name. And generally is it on this way possible to use e.g. Postman to check the correct functionality of the interface. It is not possible to transfer German umlauts via the HTTP request header on this way. But you can pack those kind of information in a HTTP request body. In this case you can’t use the GET method for the HTTP request, it is necessary to change it to POST. Here the adjusted method. Now we check the POST method and convert the body data via two function calls in a string. 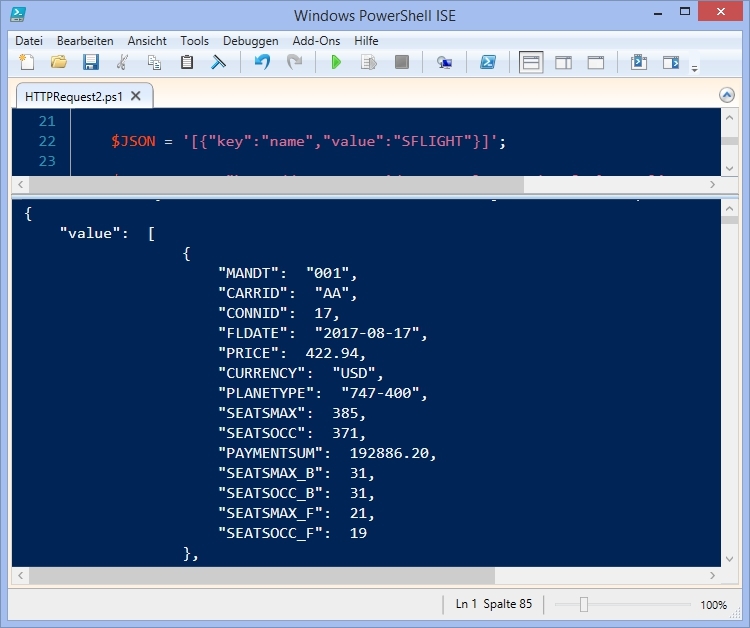 Here now the PowerShell script. 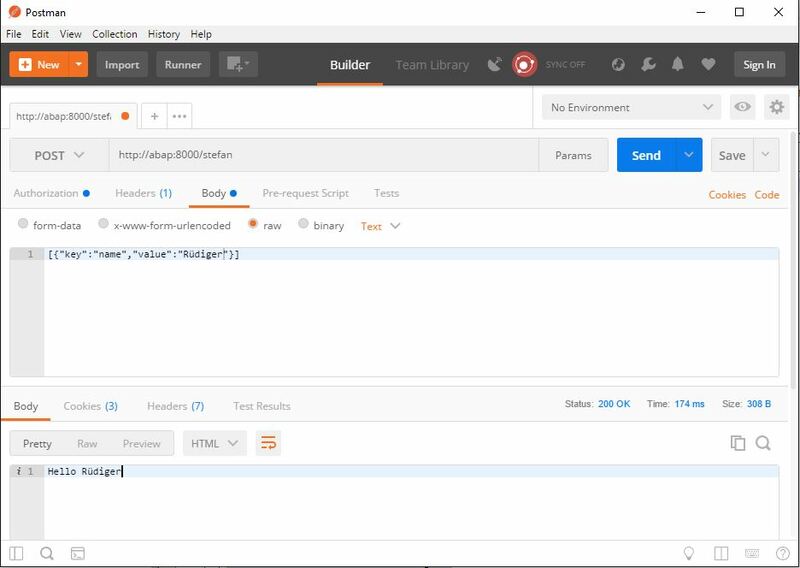 We add in the header a new field with the content type and the web request invoke contains now a body parameter with the JSON data. Here now a tiny modification of the get_data method. Now the name contains a table name and the method delivers the whole content of a table in JSON format. CREATE DATA lo_table TYPE TABLE OF (lv_name). SELECT * INTO TABLE <lt_table> FROM (lv_name). rv_output = /ui2/cl_json=>serialize( data = <lt_table> ). Could it be easier possible to communicate with an SAP system?